We have organized a manual handling course for April 6th in the Lir, Dublin. The Stage Pass previously advertised as being held in The Town Hall Theatre Galway has been moved to The Black Box in Galway. 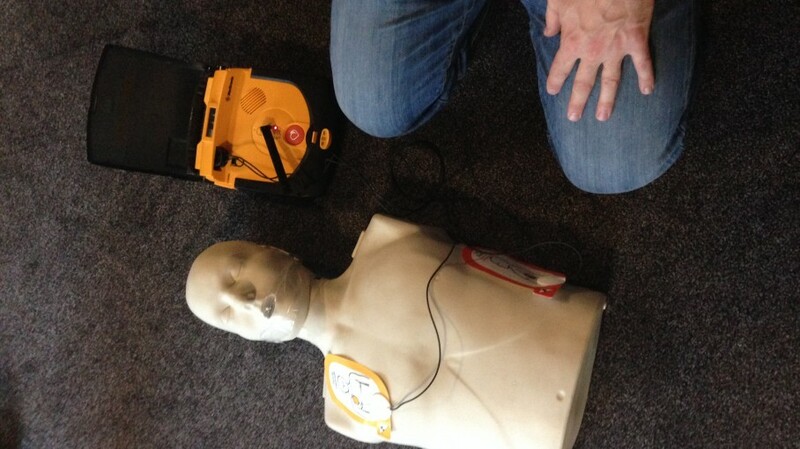 This March we will be running a three day Occupational First Aid course in BGET. The cost is €100 to members and €165 to non-members. Following on from the motion passed at the AIST AGM 2016, the AIST Board have been looking at the issues associated with the lack of appropriate technical staffing for touring productions commonly referred to as ‘Show In A Bag’. 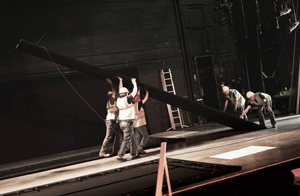 No technical production staff in the touring company results in poor advance communication of the technical needs of the production with the venues. This makes it difficult for the venue to plan for the touring shows needs and plan for their get in day. The touring show suffers from lack of quality and consistency as it tours from venue to venue with no one to oversee the quality of lighting, sound, staging or video used. After the arrival of the company quite often rehanging or moving of equipment is needed due to lack of venue specific plans or poor communication of generic plans. Health and Safety is put at risk. The risks are most acute in relation to working at height where minimum staffing levels are required regardless of how simple or complicated the setup of a show is. 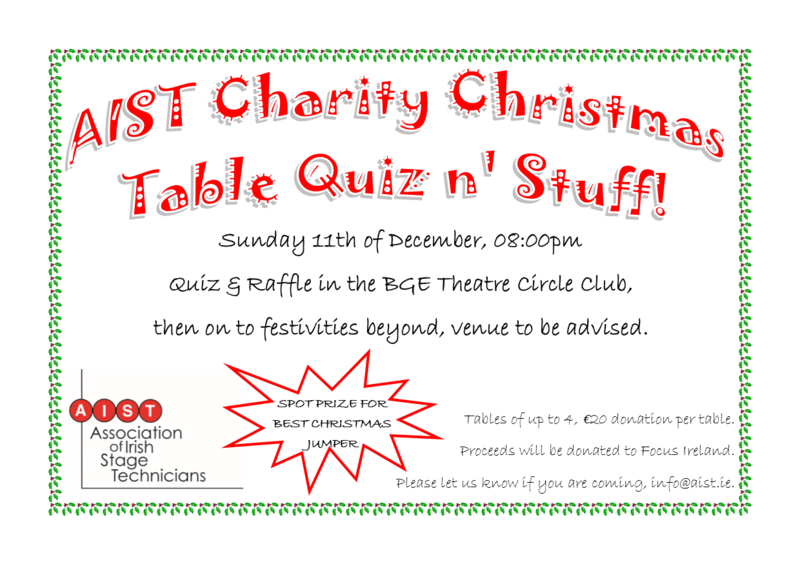 To promote safety and technical excellence in Irish Theatre. We plan to meet with Theatre Forum, Fishamble, Irish Theatre Institute and Dublin Fringe Festival to start the discussion on the issues outlined above. Our AGM will be held on Thursday the 2nd March 2017 at 12 noon in The Clarence Hotel Dublin. If you can hang around after for some chats there will be tea, coffee and sandwiches too. It would be great to get some new people involved in the organization. If anyone is interested in becoming a board member email info@aist.ie or chat to one of the board members. Nominations may be made by the nominee or any paid up member. Any item you would like to add to the agenda may be done so by email by February 24th. We will endeavor to get all items in but the more notice given the easier it will be. Any item you want to add after this date can be put forward under “any other business” through the chair. All are welcome to attend that AGM and contribute but only paid up members may vote. Fees are €20 or €10 for Students. We have organized a Stage Pass in The Sound Training Centre Dublin for February 11th, from 10am to 4.30pm. A MEWP IPAF training course in 3a Mobile Vertical & 3b Mobile Boom has been organized for February 28th 2017. This course has limited spaces and must be booked via our website. If there is demand we will organize another in March. The ANNUAL GENERAL MEETING of the Association of Irish Stage Technicians will be held on Thursday the 2nd March 2017 at 12 noon in Dublin. All are welcome to attend and contribute but only paid up members may vote. You can join on the day by cash or credit/debit card via the Website (www.aist.ie) by 6pm on 01st March. We would encourage anyone who feels that they can contribute to put themselves forward. Any member paid up by 12 noon on March 02nd can be nominated to any position. Nominations may be made by the nominee or any paid up member by emailing info@aist.ie or approaching one of the board members. We are organizing a Stage Pass course for next month in Galway. It will be held in The Town Hall Theatre on February 22nd from 11am to 5.30pm.